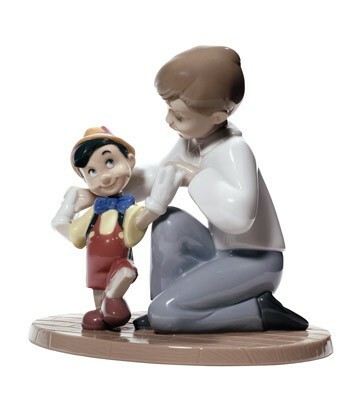 This interesting figure shows Pinocchio taking his first faltering steps. Meanwhile, his young friend is attentive to his every move as he encourages him to walk. This handmade porcelain piece is a must-have, whether you're a serious collector or fan of the classic film. Comment from your curator: "Nice to see Disney's Pinocchio depicted in the Lladro style, at once respectful to both artistic styles!"